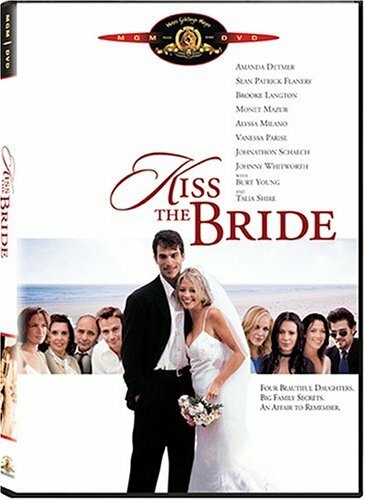 Kiss The Bride - BUY THIS DVD! There�s nothing like a wedding to bring out the best�and the worst�in a family� Fall in love with the Sposatos in Kiss The Bride, arriving on DVD and VHS February 8th from MGM Home Entertainment. Starring Alyssa Milano (�Charmed�), Talia Shire (Rocky, I Heart Huckabees) and Burt Young (Rocky), Kiss The Bride is a touching romantic comedy about four sisters who reignite their long-buried sibling rivalry as one of them prepares for her wedding. Just in time for Valentine�s Day, Kiss The Bride features unforgettable performances by Monet Mazur (Monster-In-Law), Brooke Langton (�Melrose Place�), Sean Patrick Flannery (�The Adventures Of Young Indiana Jones�) and Johnathon Schaech (That Thing You Do!). HOW TO WIN? SIMPLE. FIRST - Rate and place your comments for 5 movies here in our database. Just scroll down to the bottom of any review, drop a quickie comment and click "Submit Your Comments". THEN SEND IN YOUR NAME AND ADDRESS TO contests@efilmcritic.com. Put "KISS THE ALYSSA" in the subject line and cross your fingers. We will draw names and one of the DVD sets from MGM will be yours. Only 1 entry per household.